Includes Limonius spp. and Agriotes spp. Pest description and crop damage Wireworms are the most important soil-dwelling pests infesting crops in the Pacific Northwest. The adults, known as click beetles (Elateridae family), do little or no damage. The larval or immature stages cause major damage to seedlings and the underground portions of many annual crops. 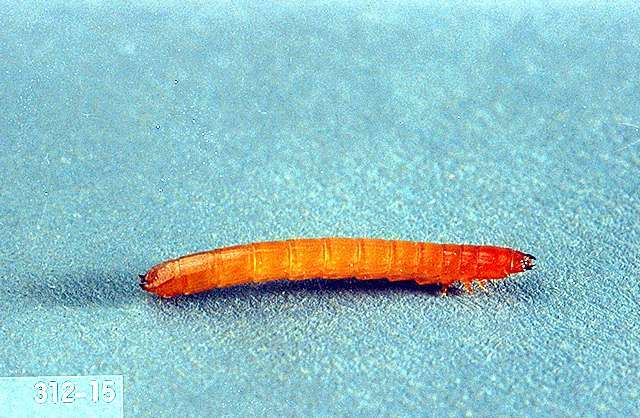 The larvae are shiny white at first, but later become straw color or light brown. They look wiry and are about 1 inch long when mature. Several kinds of wireworms are in the Pacific Northwest. 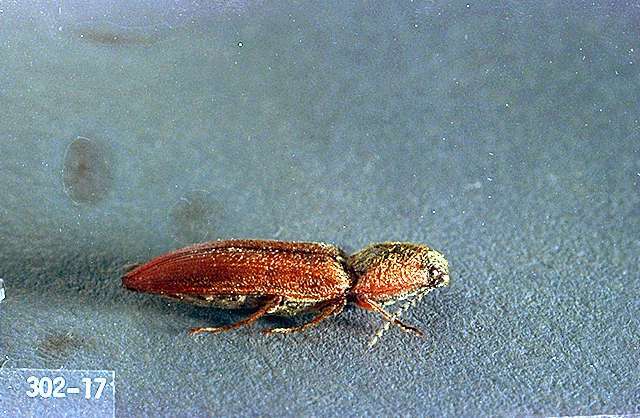 Those causing the most damage in irrigated land are the Pacific Coast wireworm (Limonius canus), the sugar beet wireworm (L. californicus), the western field wireworm (L. infuscatus), and the Columbia Basin wireworm (L. subauratus). 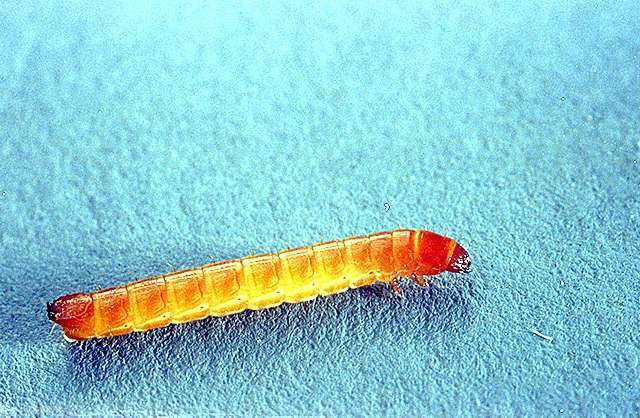 Of these, Pacific Coast and sugar beet wireworms are the most common species. 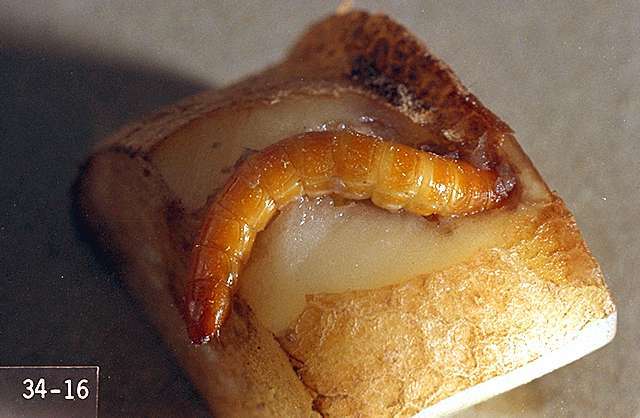 Land with annual rainfall less than 15 inches may be infested with the Great Basin wireworm (Ctenicera pruinina). As a result, there may be serious damage when irrigated crops are grown on sagebrush or dry wheat land. This species tends to disappear after a few years of intensive irrigation, but may be replaced by the more serious Limonius spp., which favor moist conditions. West of the Cascade Mountains, other species of wireworms, including Agriotes spp., are pests. No crop is immune to attack by wireworms, but these pests are most destructive on beans, corn, grain, potatoes, and other annual crops. In potatoes, serious damage results from wireworms tunneling in tubers during feeding. Wireworms damage seed potato after planting, and developing tubers later. Wireworm damage most often is characterized by holes bored directly into the tubers. These holes frequently are healed over, indicating that damage occurred sometime before harvest. Processors have a very low tolerance for wireworm damage and zero tolerance for wireworms in raw product. Biology and life history Depending on species, wireworms may require two to six years to mature. They overwinter 12 to 24 inches deep in the soil and return near the surface in spring to resume feeding. Mature larvae pupate in the soil, developing into adults that will remain in the soil until the following spring, when they emerge, mate, and lay eggs. Because the female beetles fly very little, infestations do not spread rapidly from field to field. Scouting and thresholds Ideally, the presence of wireworm in a field should be determined before using control measures. However, effectively determining wireworm density is difficult and/or impractical on the large fields that are the rule in many areas. Crop sequence also is important; thus, planting a susceptible crop such as potatoes immediately after red clover or grain is risky. In fields that are plowed deeply in the fall, wireworms will turn up during plowing. They may be detected by following behind the plow and checking for them in the turned up soil. Fall plowing, however, is becoming much less common. There are no established treatment thresholds for wireworms in potatoes. Management decisions are a complex assessment of crop history, scouting, previous pesticide treatments, etc. Crop rotation is an important tool for wireworm control. Wireworms tend to increase rapidly among red and sweet clover and small grains (particularly barley and wheat). Birds feeding in recently plowed fields destroy many wireworms. However, in seriously infested fields this does not reduce the overall pest population below economic levels. To date, field tests of entomopathogenic nematodes in wireworm infested fields show they do not effectively control wireworms. There are no parasites or biological insecticides known to be effective in wireworm control, but research is ongoing in this area. An important management consideration is avoiding prolonged periods of time between vine death and harvest. Typical wireworm damage occurs mid-season and results at harvest in healed holes in tubers; however, tubers left in the field for weeks after vine death can be re-infested resulting in serious tuber damage and tubers containing wireworms at harvest.